I am an international motivational speaker and train, develop and coach Management Assistants worldwide in soft skills such as communication, influencing and persuasion, planning, organisation, time and stress management, building and managing relationships, networking, dealing with difficult people, dealing with different management styles and personality types, delegation, motivation, minute taking, confidence, appraisals, organising meetings and events, and presentation skills and more. I develop bespoke training as well as speak at conferences and also deliver one hour to 4 day workshops. I am delighted to travel anywhere in the world to help like-minded people. I have worked in Australia (Sydney, Melbourne, Brisbane and Perth), Dubai, Qatar, Oman, Bahrain, Shanghai, Cyprus, Germany, France, Zimbabwe, Johannesburg, Kenya, Ireland and the UK. 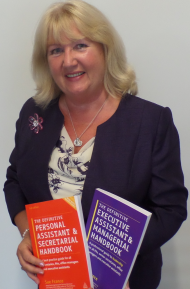 I am the author of the best selling assistant book – “The Definitive Personal Assistant & Secretarial Handbook” and my new book will be out in November 2012 – “The Executive Assistant & Managerial Handbook”. I have worked in the industry for over 30 years and have practical experience as an executive assistant, events manager and office manager. I have also had my own assistant so know and understand both sides of the coin. I am an award winning PA having won The UK Times Creme/DHL PA of the Year 2006. I am the UK Chairman of European Management Assistants (a voluntary networking organisation for Assistants in 25 European countries). I am a Fellow and Qualified Learning & Development Practitioner of the Chartered Institute of Personnel & Development (FCIPD) and a Certified Neuro Linguistic Programming Practitioner (INLPTA) as well as a certified TetraMap® Facilitator. I am also an associate Trainer for Reed Learning UK. I am an editorial Board Member for The Executive Secretary magazine and regularly write articles. I am constantly up-skilling and learning and enjoying life’s challenges and opportunities. TetraMap® is a fabulous tool to help people to easily understand different personality styles and how to best interact with them in order to influence and persuade, reduce conflict and build relationships. I can teach Assistants worldwide as it is appropriate in every culture, industry and organisation. Compared to other personality type models, TetraMap® is a language that people understand and is a framework for looking at 4 different perspectives with no opposites and it has positive outcomes . It can also be linked across all the other profiles. It is suitable for individuals when one to one coaching, working with teams and working with leaders. I have attended many workshops with different trainers, but, honestly, no workshop is like your workshop on “Becoming World Class Executive Assistant” held in Doha. I was really impressed by the interesting way you delivered the presentations. We felt that we were ready to listen to you for hours for it was so rich with quality information and skills, which proved how efficient you are. From day one I started applying some of the skills you gave us to work with and my God IT WORKS. Also, I would like to refer to your book “The Definitive Personal Assistant & Secretarial Handbook” which I consider a valuable reference for any Executive Assistant, and I am sure it will change anyone’s life once he/she reads it. 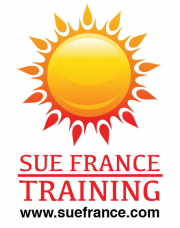 I am so eager to attend more of your workshops, and looking forward to reading your new books… Madame Sue France, simply, YOU ARE THE BEST.